TO GET THIS DEAL, simply add the three books to your basket and the price will adjust to $45. You’ll find the two other books in the “Related Items” section above. THIS MIND-BLOWING FEAST for the eye uses photorealistic, computer-generated images to illustrate what dinosaurs might have looked like in their natural environment. Complementing the extraordinary images is an exciting, natural history-inspired story about a young ankylosaur (a plant-eating, heavy-plated dinosaur) living along the lush banks of a lake. When he encounters an old ankylosaur, he gently endeavors to make contact, only to be rebuffed. Then a T. rex attacks, and old dinosaur is in grave danger. Will the T. rex triumph? It looks that way, until the young ankylosaur comes to the rescue, tail club swinging. Ankylosaur Attack is book one in the Tales of Prehistoric Life series. 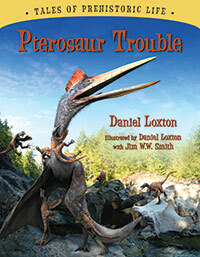 Dramatic stories + eye-popping visuals = a surefire hit with young dinosaur lovers. Ankylosaur Attack is a visual masterpiece. 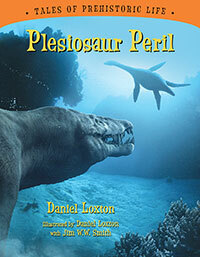 A combination of minimal text containing maximal information and computer-generated, photo-realistic images of the creatures in their natural setting makes Loxton’s book a mind-blower/eyeball popper for that dino-crazy species that lives among us. Even by current high standards, the full-spread art is uncommonly photorealistic. This little gem delivers everything the title promises with sharp, realistic illustrations. The computer generated illustrations aspire to the vividness and realism of film stills and they come very close…. [S]tunningly illustrated…a great resource for sparking a scientific conversation with a kid. Astonishing life-like artwork and exciting text combine to create a thrilling story all young dinosaur lovers will enjoy.